Gauthier, Dave. "Avalanche". The Canadian Encyclopedia, 04 March 2015, Historica Canada. https://www.thecanadianencyclopedia.ca/en/article/avalanche. Accessed 23 April 2019. An avalanche is a rapid, downslope movement of snow, with varying proportions of ice, water, rock, soil and vegetation. 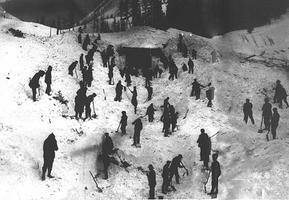 Rescuers dig into the mass of snow and ice searching for 62 railway workers buried in an avalanche, March 4, 1910. Only one man survived (courtesy British Columbia Archives). A point-release snow avalanche, north of Lake Louise, Alberta (courtesy Natural Resources Canada/2000-102). A small avalanche slope with an indistinct start zone, track and runout area (courtesy Natural Resources Canada/2000-106). An avalanche is a rapid, downslope movement of snow, with varying proportions of ice, water, rock, soil and vegetation. In other mass movements, such as landslides, rock slides, or rock avalanches, snow is not the major component. In Canada, avalanches are most common in the mountainous regions of British Columbia, Alberta and the Yukon. Snow avalanches are classified as either "loose" or "slab," referring to the initial condition of the sliding snow. In loose snow avalanches, a small volume (less than 1 m3) of loose snow separates from the surface. As the initial mass descends, it gathers more snow, producing an ever-widening, triangular track. Loose snow avalanches may also be called "point releases," because they start from a point and fan out. 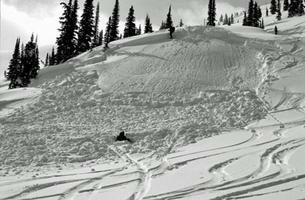 In general, loose snow avalanches tend to be smaller and less dangerous than slab avalanches. Slab avalanches occur when a cohesive, stiff, planar snow slab becomes detached from the underlying snowpack and slides downslope. Slabs can be as little as 0.1 m thick, or may involve the entire snowpack of several metres in depth. Thicker slabs tend to release over larger areas, in many cases exceeding 10,000 m2 (or 1 hectare). Slab avalanches are more hazardous than loose snow avalanches because of the large amount of snow set in motion at once. Avalanches can occur anywhere with steep slopes and unstable snow. Even very small slopes (less than 10 m high) may produce avalanches under certain conditions. Loose snow avalanches occur due to the loss of cohesion of soft, near-surface snow. This may occur spontaneously due to warming, insolation (i.e., exposure to the sun's energy), build up of storm snow or they may be triggered by an external disturbance such as a person or animal passing over a slope. Slab avalanches release when a shear or collapse fracture occurs in an underlying weak layer. The fracture is triggered, and then spreads up, down, or across the slope. External forces such as wind, the weight of snowfall, humans, animals and vehicles may cause overloading, triggering a fracture in the weak layer. It may also occur spontaneously because of a change in the mechanical properties of the snowpack (such as slab stiffness or density) due to rapid temperature changes or other factors. The avalanche size classification scheme used in Canada ranks avalanches on a scale of one to five. Size one avalanches are relatively harmless to people. Size two avalanches are large enough to bury, injure or kill a person. Size three avalanches are large enough to destroy a car or small building, or break a few trees. Size four avalanches could destroy a railway car, large truck or building, or up to four hectares of forest. The largest avalanches (size five) could destroy a village or up to 40 hectares of forest. While the smallest avalanches (size one) travel relatively short distances (10 m) and have an impact pressure of one kiloPascal (kPa), size five avalanches can travel up to 3,000 m, include large volumes of snow (up to 100,000 m3) and impact with great pressure (100 kPa). Fortunately, the frequency of avalanches decreases as their size increases: size one avalanches are very common, and size five avalanches occur very rarely. Large and small avalanches are very common in the mountains of British Columbia, Alberta and the Yukon during the winter. Significant avalanche hazard also exists in Québec, Newfoundland and Labrador, Nunavut and the Northwest Territories. Avalanches are exceedingly rare in the other provinces, although one fatal avalanche did occur in Toronto, Ontario. Professional avalanche forecasters rely on avalanche, snow and weather observations in order to predict or forecast avalanches. Recent avalanches and other signs of unstable snow, as well as heavy precipitation, rising temperatures and strong winds are usually associated with increased avalanche hazard. The Canadian Avalanche Association (CAA) is the governing association for professional avalanche workers in Canada who are employed by ski hills, backcountry operations, and government and private companies working in avalanche areas. These professionals provide avalanche forecasting and control services tailored for particular locations or activities. Avalanche risk may be mitigated by removing people or property from areas affected by avalanches, or by protecting elements at risk using engineered sheds, walls, ledges and deflectors to absorb, dissipate or redirect moving avalanches. Land-use planners and engineers assess the risk to a given location and restrict development or specify mitigation measures to reduce risk to an acceptable level. Often, active avalanche control is required to protect people and infrastructure that cannot be relocated or otherwise protected. Explosives -- including hand-charges, artillery shells and propane blasts -- are applied to unstable slopes by professional avalanche workers in order to bring down smaller, controlled and predictable avalanches. During times of elevated avalanche hazard when passive or active control is not possible, work sites may be evacuated or transportation corridors may be closed to public or industrial traffic. Fatal avalanche accidents occur in Canada each winter: an average of 10-15 people die every year. Historical accidents typically involved workers at industrial sites; notable accidents occurred at Rogers Pass, British Columbia, on 4 March 1910 (58 fatalities), near Britannia Mine, British Columbia, on 22 March 1915 (57 fatalities) and at Granduc Mine, British Columbia, on 18 February 1965 (26 fatalities). In the case of Rogers Pass, an avalanche engulfed a work crew that had been clearing snow from an earlier slide across the Canadian Pacific Railway main line. Only one man survived. However, the victims of recent accidents tend to be recreational backcountry enthusiasts such as skiers or snowmobilers, as was the case in the Columbia Mountains of British Columbia on 20 January and 1 February of 2003 (with seven fatalities in each incident). On 13 November 1998, Pierre Trudeau’s youngest son, Michel, died in an avalanche while skiing in Kokanee Glacier Provincial Park. In addition, the tragedy at Kangiqsualujjuaq, Québec, on the morning of 1 January 1999, illustrates the danger avalanches pose to communities: nine people (five of them children under the age of eight) were killed when snow smashed into a school where most of the small community were celebrating the New Year. Victims of avalanche typically die of asphyxia or trauma sustained during the avalanche. The likelihood of surviving decreases rapidly after approximately ten minutes of burial. Most persons who knowingly travel in avalanche terrain wear radio-frequency transceivers, which broadcast a signal to allow searchers -- using the same device -- to locate them if they become buried. Conversely, any person wearing such a beacon can perform a search immediately after an avalanche occurs. This type of rescue is often the avalanche victim's best chance for survival, although people have been recovered alive after long burials by avalanche dog, systematic probing or other means. Cam Campbell, Laura Bakermans, Bruce Jamieson, Chris Stethem, Current and Future Snow Avalanche Threats and Mitigation Measures in Canada (2007); Bruce Jamieson, Pascal Hageli, Dave Gauthier, Avalanche Accidents in Canada, Volume 5, 1996-2007 (2011); David McClung and Peter Schaerer, The Avalanche Handbook (first edition by R.I. Perla, 1976; 3rd edition 2006). Canadian Avalanche BulletinThe website for the (CSAC) Canadian Avalanche Bulletin. Canadian Avalanche Centre The Canadian Avalanche Centre provides public avalanche safety warnings and promotes public avalanche awareness and education.